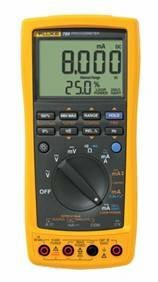 Fluke combined a loop calibrator and a DMM to give process technicians double the power in one tool (the Fluke 787). Now we made it even better – the ultimate loop calibration multimeter – the Fluke 789 ProcessMeter. The 789 has a display that's not only twice as large, but also twice as bright with two levels of backlighting. With its built–in, selectable 250 ohm HART® resistor, it eliminates the need to carry a separate resistor with you. Now process technicians can do a lot more while carrying a lot less.